I am pleased to announce that my artwork will be hanging in the Fernwood Inn for the months of April and May! 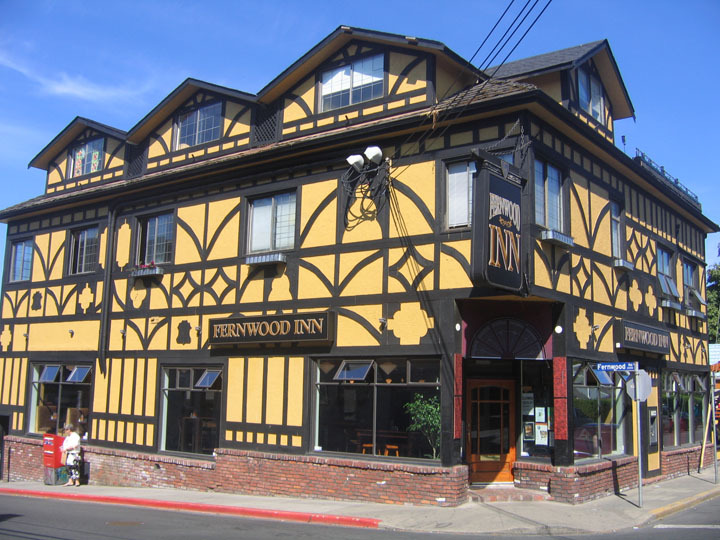 The Fernwood Inn is located right in the heart of funky Fernwood, at 1302 Gladstone Avenue (corner of Gladstone Ave and Fernwood Rd). The Inn provides tremendous support for local artists-- both visual artists and musicians-- and I am very excited to have my paintings grace the walls of their Art Room for the next two months. Thank you for your continued support and interest in my artwork! This post was originally featured in my February 2011 monthly e-newsletter. Sign up for future newsletters to receive background information about featured paintings as well as subscriber-only discounts. The Church of St. John the Divine is a stunning brick building situated on Quadra Street in Victoria, in between two equally impressive churches: the First Metropolitan United Church and the Victoria Conservatory of Music (which was formerly the Metropolitan United Church). The congregation of St. John the Divine celebrated its 100th anniversary in 2010, and the building where they worship will also mark its 100th anniversary in 2012. This particular painting incorporates some of my favourite natural elements, such as the evening sky and stars. I love painting places of worship at night, because it allows me to highlight the warmth, light, and jubilance that emanates from them when the congregation is inside celebrating. The juxtaposition of a dark sky outside with the opulent light inside acts as a metaphor for spirituality itself while creating a visually pleasing painting as well. Although I do not personally practice any specific religion, I do revere all types of holy buildings and respect the power that is generated when like-minded individuals are brought together in spirit. Prior to this particular drawing, all of my renderings of buildings had been done meticulously and true-to-form in traditional drafting style. This pen and ink sketch, with its wobbly lines and organic movement, represented a radical departure from my technical training, and it also flung open the gate of creativity for me. I could not have known it at the time, but this experimental drawing in late 2002 would stimulate a watershed of inspiration inside of me and would steer my artistic career for the next eight years (and counting)! Although I was based in Calgary, Alberta at the time, my earliest sketches in this fluid style—including my drawing of the Church of St. John the Divine—were completed in Victoria. I spent several weeks at a time in Victoria, sitting in front of the city’s many beautiful churches with my sketchbook in hand. One day, after conceiving a basic composition for a rendering of the Church of St. John the Divine, I sat in the Wildfire Bakery on Quadra Street and started fleshing out my drawing in pen and ink. Within an hour of sitting down, a regular patron of the bakery had offered to purchase my drawing from me. Wanting to complete the piece first as a study for a future painting, I coloured my drawing in that evening and sold it to him the next day. It was my first sale in this new style: an auspicious occurrence, indeed! The rest, as they say, is history. I have been working in this style and selling my artwork now since 2002, but incredibly enough, I have yet to create a painting of this original sketch, and I only recently (late 2010) painted my second rendition of the Church of St. John the Divine (pictured at the top of this message). I found myself almost overwhelmed with inspiration since starting to paint in the architectural etherealism style, and many historical buildings and charismatic landmarks found their way onto my canvases before the Church of St. John the Divine finally got its turn. No plans have been made at this point to offer this painting in limited edition canvas giclée reproductions. Block-mounted 8”x10” prints are available upon request for $30 plus taxes. 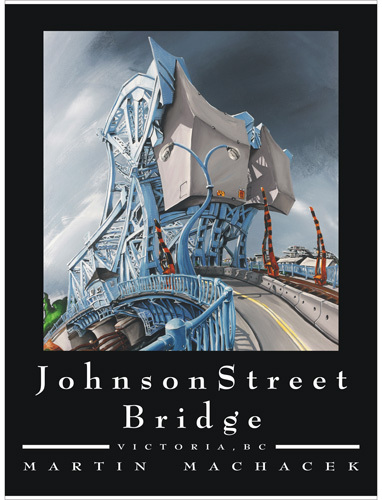 Johnson Street Bridge Painting Wins People's Choice Award! Throughout the month of February, I displayed two of my original pieces at the LOOK Victoria 2011 Regional Arts Exhibition and Sale, which was organized by the Community Arts Council of Greater Victoria and hosted in the Bay Centre. I am absolutely thrilled to let you know that my Johnson Street Bridge painting received the People's Choice Award for this show! 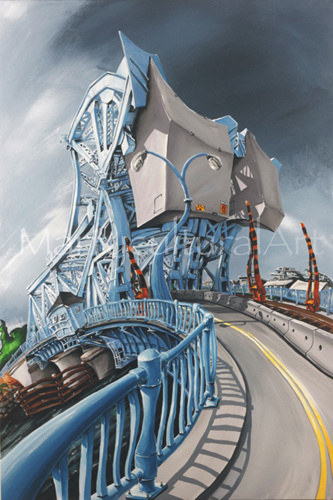 'Johnson Street Bridge', copyright 2010 Martin Machacek. Winner of the juried Honourable Mention prize and the People's Choice Award at the LOOK Victoria 2011 Regional Arts Exhibition and Sale. Also named 'Best in Show' by Robert Amos of the Times Colonist. Over 12,000 people attended the show throughout its month-long duration, and each attendee was invited to cast a vote for their favourite piece in the exhibition. With 450+ pieces submitted for the show by over 200 artists throughout the region, I feel extremely honoured to have been selected as the recipient of the People's Choice Award. Thank you to everyone who took the time to stop by and view the exhibition, and special thanks extended to those who cast a vote for my painting! Your support of my artwork and my livelihood is much appreciated. 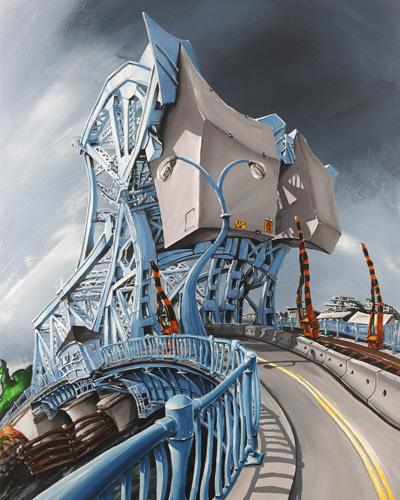 I'm incredibly pleased to announce that my Johnson Street Bridge painting was awarded an 'Opus Honourable Mention' prize at the opening for the LOOK Victoria 2011 Regional Arts Exhibition and Sale last night! 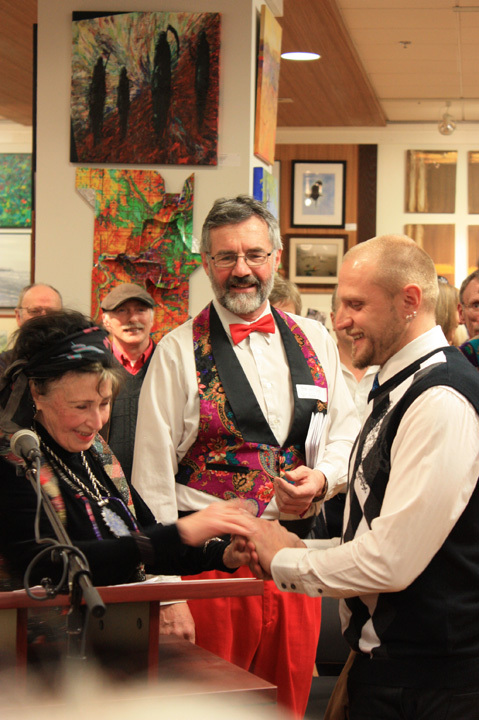 Receiving my award from the internationally-acclaimed artist, Pat Martin Bates. I feel very humbled to have been selected for this award, especially because over 450 pieces of art from 230+ artists were submitted for this show, and the jury was comprised of very esteemed members of Victoria's art community. Thank you! First of all, the original painting (the one that is framed and on display at the LOOK Victoria Art Show) is not for sale. I have decided to keep this painting as part of my personal collection. Printed onto archival-quality photographic paper, will fit any standard-sized 8"x10" frame. This is the 8"x10" photographic print mounted onto 3/4" MDF and UV-coated for protection. The back of the wood is pre-drilled for hanging, and there is also a hole near the bottom if you wish to stand the piece up rather than hang it on the wall. Printed on acid-free heavy cardstock paper, bordered in black with "Johnson Street Bridge" typeset included near the bottom. Will fit into any standard-sized 12"x16" frame. Meticulously colour-matched to the original painting. Hand-signed and hand-numbered by myself; comes stretched and wired to hang. (Unframed) This is the size of the original painting. Thank you again to the jury of the LOOK Victoria 2011 Art Show for selecting my painting for an award, and thanks to all of you for your continued interest and support! I appreciate it! 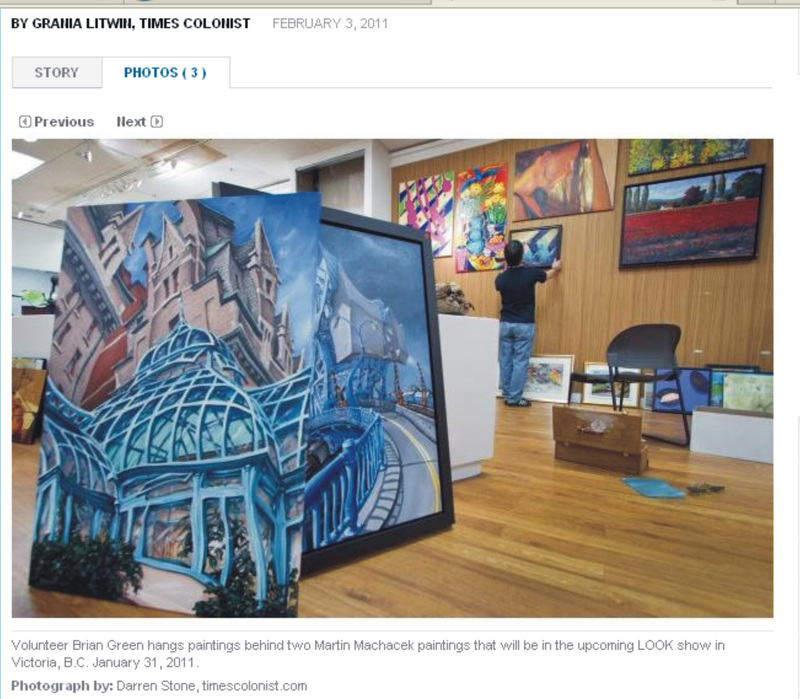 Martycultural Art in Today's Times Colonist! 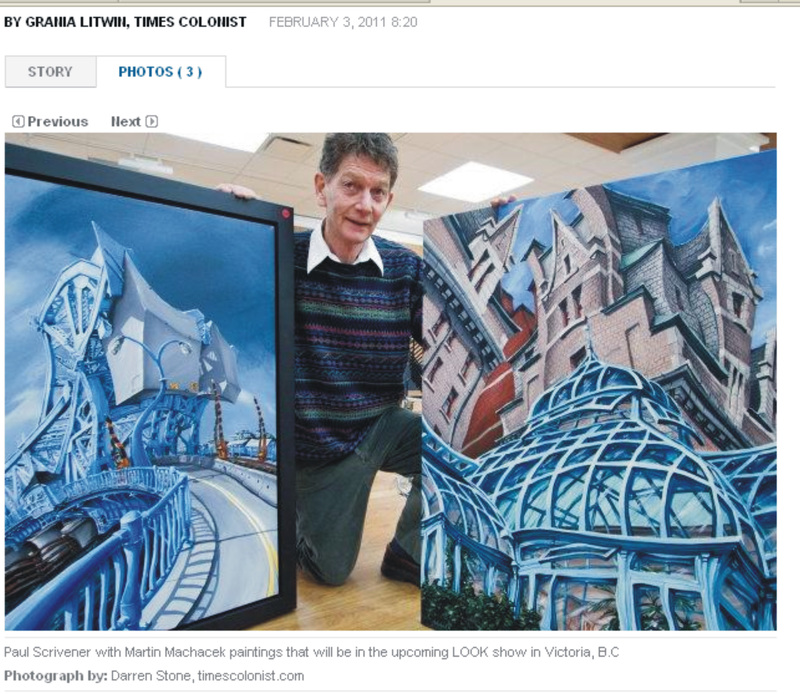 I'm excited to let you know that my paintings are featured in today's Times Colonist newspaper to help promote the LOOK Victoria 2011 Art Show! Check out the full article and photos in the online edition here, or grab a hard copy of today's paper and check out page C6. I'm especially pleased to have a picture of my new painting in the paper, Victoria Conference Centre Pavilion, because (as I mentioned in my previous post), I didn't even get a chance to photograph it myself before I submitted it to the LOOK show! Hope to see some of you at the Opening Night event tomorrow.